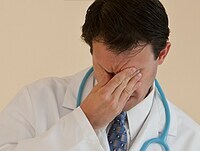 Which Physicians Are Most Burned Out? Does Burnout Affect Their Health, Their Marriages? Is Overweight a Problem in Physicians? This article reviews the background and major findings of the 2013 physician lifestyle survey, which focused on the links between lifestyle and burnout. Why Are MDs Burning Out in Record Numbers? Physician burnout rates are at an all-time high, and greater than average suicide rates are just one of its consequences. Expert Dr. Paul Griner talks about burnout and how doctors can combat it. Medscape's 2013 Physician Lifestyle Report provides physicians with insight on how burnout may affect their lifestyle choices and experiences. This comprehensive report represents responses from close to over 24,000 US physicians and reveals details on their political and spiritual beliefs, health, family life, and vacations.